At least eight MNS workers were arrested in this connection, a senior police official said. MUMBAI: Some members of the Maharashtra Navnirman Sena (MNS) dug up a pavement outside the Mantralaya, the state secretariat here, in the wee hours today as a mark of protest against potholes on roads, police said. "A group of around 20 workers of the MNS gathered outside the Mantralaya around 3 am today and started digging up a footpath using spades and other tools to protest against the potholes on roads," he said. The police staff posted on duty at the Mantralaya rushed towards the protesters and tried to stop them, he said. "All the MNS members present there were taken to the Marine Drive police station, where eight of them involved in digging up the footpath were arrested," Manojkumar Sharma, Deputy Commissioner of Police (Zone -I) said. This comes a day after some MNS members attacked a government office in adjoining Navi Mumbai, to vent their ire over potholes dotting the 39-km stretch between Sion and Panvel. Accidents on pothole-ridden roads have claimed five lives in adjoining Thane region since last month. 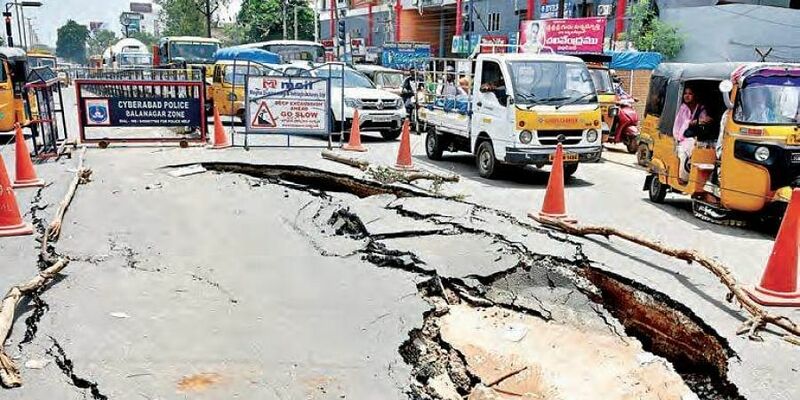 The victims lost balance and fell as their two-wheeler hit potholes.